Matt Moore's struggle with Florida State League hitting continued as he surrendered five runs in the home half of the first inning to put the Stone Crabs in the hole early. Moore gave up two walks in the inning as well as RBI singles to Kyler Burke and Michael Brenley. The fatal blow was a three run home run by Smaily Borges to put the Cubs ahead 5-0. The Stone Crabs posted their first run of the night in the second inning. Stephen Vogt singled to right then later scored on an RBI double by Matt Spring. Daytona added to their lead in the fifth inning. Brett Jackson singled to short to lead off the inning. Jackson would move along the basepath on a sac bunt and a passed ball before scoring on a sacrifice fly by DJ LeMahieu to increase the lead to 6-1. 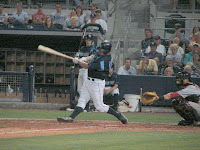 The Stone Crabs made a last ditch effort to get back into the game in the ninth inning. Vogt got things started with a solo home run to right. Spring singled on a line drive then later scored on a ground ball by Reid Fronk. But the really fell short and the Stone Crabs took the 6-3 loss. Moore has yet to record his first FSL win, falling to 0-7 with the loss. Moore pitched 6 innings and allowed 6 runs (5 earned) on 6 hits with 5 strikeouts and a 3 walks. Chris Andujar pitched 2 no-hit innings of relief with 2 strikeouts. The Stone Crabs wrap up the four game series against the Cubs on Friday night at Jackie Robinson Ballpark. Shane Dyer (2-1, 1.50) will make the start for the Stone Crabs against Chris Rusin (2-1, 4.78) for Daytona. What happened to matt moore? His stuff still seems to be sharp, but he can't command it, leading to a) a lot of walks and b) pitches left over the plate that get hit hard. I have had the opportunity to see Moore pitch three time (twice in spring training and opening day). I was impressed by his pitches and like what I saw. The problem seems to be consistency. While he posses the stuff to get the job done, he is going too deep into the count and walking too many. It also seems that when his back is against the ropes, he loses the mental aspect and gets deeper into trouble resulting in the big innings by the opponents. I am still waiting for him to break the cycle and each start seems to bring us closer to the breaking point. I have not given up hope, I think once he is over the hurdle he will run wild on the FSL hitters.